Rick Riordan writes middle grade and young adult adventure books in a way that makes me drool (as I’m rapidly turning pages to discover what happens next). His newest series, Magnus Chase and the Gods of Asgard, delivers nothing less. When a book begins with the main character’s death, you know something interesting has got to happen next. Otherwise, the story would be over. Epic fail. Will he be resurrected? I know it isn’t all a dream because Riordan is too skilled to fall into that trap. Is it all going to happen in the afterlife? All in all, it earns a solid 4.5 stars from me. Yes, I am surprised that it didn’t make five stars -it’s the amazing Rick Riordan-but I’ll explain my reasons during this review. Magnus Chase (if you recognize the surname here from another series, you’re not wrong) has been living on the streets since his mother’s murder. Apparently, this is a relatively safe thing for a boy to do in Boston. Or maybe just because two other homeless guys are watching out for him. The story opens with his relatives looking for him. What? He had relatives and they just let him live on the streets? You’ll understand the reasoning before too long. Magnus has an important destiny in the scheme of the Norse doomsday, Ragnarok. This brings a fire giant, slinging meteors, into downtown Boston. There’s a showdown. Magnus goes over the bridge and wakes up in Valhalla. If you’re not current with your Norse mythology, never fear. Riordan does a great job weaving the information you need to understand what’s happening into the story. Magnus makes a few friends. Gets his Valkyrie fired. Is the subject of a dire prophecy. Dies a few more times in practice battles. And sneaks away from Valhalla to embark on a quest to regain the Sword of Summer and stop the end of the Nine Worlds from happening. Magnus is an engaging character with an interesting background. Meeting him on the streets made me consider the ugly fact that there are plenty of homeless children living in similar situations. For real. Hopefully, none of them are being hunted by fire giants. Even though Riordan explains the familial situation, I still have a hard time accepting that Magnus would have been abandoned. His family is searching for him now, but why didn’t they do it two years ago? Why are they assuming he’s still alive? And when we find out WHO he’s related to, it seems even more unlikely (although we don’t really know the time relationship between this story and the two series featuring Percy Jackson). I admired Magnus for holding onto his sense of humor (since that is how many of us cope with difficult situations). His flippancy was a nice change from the constant sarcasm Percy Jackson uses. In other ways, though, they are similar: reluctant heroes who don’t know their fathers. I wasn’t put off by the contradictory depictions of Odin, Loki and Thor shown here (and I’m a huge Avengers fan). It’s a different universe, folks. Of course they are going to be different. Only a lazy author would make them carbon copies of something he’d seen in the movies. The biggest issue I had with accepting this story world is a single question: where are the Greek and Roman gods? Case in point: Magnus must go out and barter with a sea goddess. They only mention her husband the sea god in passing, but it isn’t Poseidon. How many deities are willing to share their realms with other deities? Shouldn’t there be a scuffle about territory? There’s no attempt to answer this burning question. It’s like those individuals don’t exist. But we know they do. The presence of Annabeth Chase brings their existence front and center. Maybe this is when they’re all amassing in Greece to face down the giants and Gaia. And yet…wouldn’t their absence be cause for even more turmoil in their domains? Don’t get me wrong. I enjoyed the book. I just wish Riordan would have set it in a different universe. He could have used our contemporary world and made that work fine. But by bringing Annabeth into the story (even in a minor way), he reminded me that there is plenty of turmoil in this world already, but it isn’t even alluded to by the Norse deities or the human world. If you love Riordan’s writing (like I do), you won’t be disappointed. He delivers another page-turner with non-stock characters. If you’ve read all his other books (like I have, with the exception of the Red Pyramid series), parts of this book will bring a sense of deja vu. Haven’t we been here before? And yet, how could that be true when we’re entering the Norse mythology of Nine Worlds? You will laugh. You might even tear up. If you want a fast-paced book with likable characters and as much humor as action, this is a book you’ll want to read. If you have read this book, what were your thoughts? Do you think I’m overreacting about questioning where the Greek and Roman (and perhaps Egyptian) deities are hiding? See my Goodreads review and come back on Monday, March 2nd for the full scope of my thoughts on this exceptional YA romance. Surely it comes as no surprise that I’m a member of a book group called “Adults Reading Kids’ Stuff.” A school librarian founded it, so none of us are shocked that she’s always recommending award-winning literature. At her urging, I accepted a library copy of Paper Towns by John Green. I’ve read some other Edgar Award winners (which this book is) and have been duly unimpressed. You can read about my take on a not-so-worthy Pulitzer Prize winner here. Our book group, ARKS, met on Friday morning for a brunch and book talk. Pairing breakfast casserole, fresh-baked cinnamon rolls and succulent watermelon with books is a no-lose proposition. Most people recognize John Green’s name. I heard him mentioned often at the Willamette Writer’s Conference in August. He shot from nowhere to best-seller. One of his best-selling books, The Fault in our Stars, wowed Time Magazine into name it best fiction book of the year and Hollywood into bringing it alive on the big screen. I love titles with double entendre. You know, simple titles like The Help that really explain something significant about the book – with a double edge. So, Paper Towns jumped out at me as a title that might prove to be such. “Quentin Jacobsen has spent a lifetime loving the magnificently adventurous Margo Roth Spiegelman from afar. So when she cracks open a window and climbs back into his life–dressed like a ninja and summoning him for an ingenious campaign of revenge–he follows. The Edgar Award it won was for mystery, which the book includes. Even with the first person narration, Green offers up clues and hints for the diligent and observant reader. There was a point in the book when I actually stopped and said aloud (to no one since I was alone) “If she is dead, I’m going to throw this book.” I don’t recommend throwing books. Especially not library books. But perhaps you see how wrapped in the plot I had become. This story is as much about Quentin’s search for understanding himself as finding the girl he loves. It even gives a teenage attempt at explaining love. It is this “coming of age” aspect of the story that makes it accessible for a wider audience than the young adults it was written for. Amidst all the quirky dialogue and friendly banter that felt too much like being a fly on the wall in my sons’ bedrooms, Green writes some memorable lines. Within that single paragraph, Green alludes to two separate works of literature while staying true to his character’s voice. I smiled when I read it, and then reread it, once aloud, just to appreciate the poetry of the prose and the power of the metaphors. All was not bliss for me in this reading. For example, I found the character of Q’s affection, Margo, to be highly inconsistent. Her reactions in several scenes later in the book didn’t ring true for me. In fact, for a few moments I almost wished the author had offed her. I know, not my typical reaction at all. Even in this, Green shows his control over the elements of an effective story. He was able to bring the story to a satisfactory resolution, one I wouldn’t have normally embraced. Because of Margo’s outlandish behavior, I happily accepted the not-so-happily-ever-after wrap up. Everyone aged 14 to 99 should read this book. I said something similar about The Book Thief. I don’t say it all that often about novels, probably because I read genre fiction. Most of that has a flavor only certain connoisseurs relish. Maybe this book is considered literary fiction. I don’t know how a young adult novel would get that distinction. However, this book has many literary qualities, including allusions to epic American literature, like Walt Whitman’s Leaves of Grass. Have you read other books by this author? What recommendations would you make? Reviewing books can be work, especially if you didn’t enjoy any aspect of the story. For authors, reviews build credibility or detract from it, depending on the contents, of course. It’s no secret that this blog is about building my author platform. In fact, every aspect of my online presence feeds into that goal. Whether I’m on Goodreads, Twitter or Facebook, I’m spreading the wealth of my personality. A review must include something to make it useful. Reviews are for both readers and authors. Readers want to know if the book is worth picking up, and authors want to know what resonated with their audience and what they might need to improve for the next book. These one-liners don’t offer aid to either camp. The characters. Did you like them or not? Did you feel like you knew them or not? The audience. If a young adult novel appealed to an adult reader, that’s something to include. If a young adult novel seemed too graphic for that age group, let readers know. Their plot – was it original? Did it hook you? Did it build to a sufficient resolution? Their characters – could you relate to them? Did you hear individual voices? Did you feel their emotions? Their writing – sometimes a style doesn’t appeal to you and that’s okay to mention as long as you give a reason. If there were catchy turns of phrases or original metaphors, the author wants you to include that detail. I think it’s appropriate to leave a review as often as you can. Most of my reviews aren’t more than five or six sentences. This can be helpful if you include information about the important elements mentioned above. If you loved a book, leave a review. Make sure you include reasons why it affected you. “I couldn’t put it down” doesn’t make me want to pick it up. If you were disappointed in one element of the story, but you enjoyed it as a whole, it’s important for the author that you leave a review. If you mention the area you felt the story was weak, the author has constructive criticism to use to improve future stories. It’s essential to leave a review so other people receive guidance when they’re searching for something to read. You help other readers with every thorough review you write. 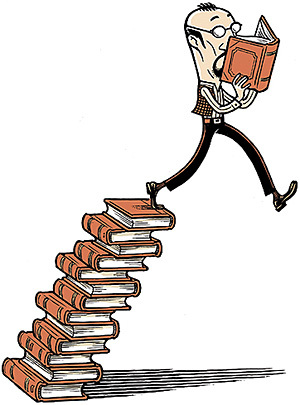 Authors want reviews because it shows their audience that the book is being read. Even if there are a few low reviews, if the average is four stars or above, people will pick it up. If you can’t think of anything positive to say about the book, don’t write a review. I’ve heard people say you should never give less than four-star reviews. This is especially true of writers. That author will remember your low review and pay you back in kind once your book is published. This seems shallow to me. If I’m so worried about getting a bad review that I don’t give honest feedback, who am I helping? No one, and I could be hurting myself. People know about me by checking out my bookshelves at Goodreads. If you can’t give sound reasoning why a book fell flat for you, don’t leave a review. I have given one two-star review and several three-star reviews. I gave my reasoning behind both of these (or didn’t do more than rate the book). I’m pretty sure my three-star review of a Salvatore book isn’t going to set the man on a path of vengeance. I hope when I mentioned weak character motivation or a slow-moving plot, the reviews resonated with the author, and they make changes if more people say similar things. Sometimes, a book just doesn’t connect with me and millions of others love it. Reading preference is as subjective a choosing an ice cream flavor. What do you think? Are there other things that should be included in a review? Perhaps you disagree about my reasoning regarding not leaving a review. Let’s discuss it. Amazon’s recommendations coupled with an extremely low price sent the young adult fantasy Prophet by R. J. Larson into my shopping cart and onto my Kindle. What could it hurt? It was a novel in my genre. Good writers read voraciously and they select titles written by peers. Success on all counts! The title compelled me. I hoped for something allegorical without a preachy undertone (or overtone). The fact it was the first book in a series didn’t hurt. If I love it, I know where to find more books I’ll enjoy. Ela, nearly 18, is an atypical girl in her society. She’s dedicated to the Infinite (deity) and subject to the will of her parents. The Infinite speaks directly into her mind. She also has visions. When given the choice to serve as his prophet, even though “all true prophets died young,” she accepts. After all, she can’t imagine a life without hearing his voice. She gets sent into the desert in a scene reminiscent of Elijah after his battle with the prophets of Baal. Afterwards, she’s sent to deliver a scathing message to a king who has viciously destroyed an innocent city. Of course, she is imprisoned. Attempts are made on her life. She meets a man. There is an intense battle and her eyes are opened to the spiritual battle around it. This haling back to Elisha praying for the eyes of his servant to be opened and see the host of the Lord encamped around the city. Just when she finds a place she loves, she is kidnapped and then directed to deliver another message. This time the recipient is an evil queen – a regular Jezebel. I enjoyed the writing and the quick-moving plot in this book. It held my interest from the beginning. The story problem is vague and generalized. This won’t be a problem for readers. There is a problem and events escalate until it is resolved. In this story, the romance isn’t a central part of the plot. It does add conflict for Ela and makes her character arc more interesting. It also adds some happiness to an otherwise dismal existence for the main character. I considered purchasing the next book in the series. It adds a minor character from this book as a major point of view character. From the blurb, it sounded like more doomsday prophecies for Ela to deliver with an overarching problem for one of the other characters to solve. It’s on my “to be read” list. I think I can learn much as a writer from the style of Larson. I have a feeling the resolution I want for Ela won’t be forthcoming and so I’m avoiding being my own sort of prophet by not reading the entire series. I gave it four stars on Goodreads and thoroughly enjoyed reading it. It didn’t get the highest marks from me because of the problems I saw with the structure. If you like allegory and a fast-paced story, you’ll find Prophet well worth the time investment. Since I reviewed Moira Young’s first novel here, I thought I’d check in with readers about the sequel. The series is called Dust Lands and it looks like it will be a trilogy. The book starts from Jack’s point of view, which is a good choice on Young’s part. He’s said to “betray” Saba in the flap copy, so seeing where that begins gives the reader sympathy for him. Later, more evidence piles up against him and Saba “sees” his betrayal with her own eyes. Her goal in this book is to find Jack, just like finding her brother was the goal in the first novel. Saba disregards everyone – pretty much like before – to set out on her rescue mission. Of course, her brother and sister refuse to be left behind (did she really think she could leave them?) so they end up facing danger with her. This time, the dystopian adventure goes awry. Through foreshadowing, the reader expects Saba to make another connection with Demalo, who is now the leader of New Eden and a new movement to remove the aged, infirm and unsavory from the planned Paradise. He’s put a price on her head, but she keeps dreaming about him. As I write this, I’m rethinking my earlier assessment that Saba blows Katniss out of the water in terms of heroic qualities. It seems Young goes just a little too far trying to give Saba flaws. By the end of this book, only Jack is still talking to her, and we’re all imagining he wouldn’t be if he knew how she had betrayed him. If you read the book, please chime in here and let me know what you think. It isn’t that I didn’t enjoy reading it; I was just frustrated that we still didn’t figure out Lugh’s issues and that Saba acted like a self-centered, lovelorn teenager, and she seemed so far above that in the first book. Source: Young, Moira. 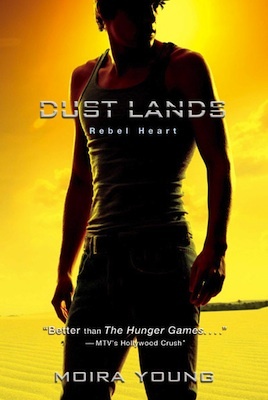 Dust Lands: Rebel Heart. New York: Simon & Schuster Children’s Pubishing Division, 2012. Print.